Many people after they saw the picture below, are wondering what the true story is. It is so misleading. Let me tell you the whole episode. About 10 years ago, I started offering scholarships to help poor students to complete their tertiary education and most of my scholarship recipients were studying in UTAR, Kampar Perak. I told all my scholarship recipients that they must remember I helped them when they were poor and when they have graduated they must help some other poor students. By this way, I am creating more and more charity worker as the years go by. Up till now, I have given more than 300 scholarships to help poor students. About 8 years ago, I offered to donate Rm 30 million to UTAR which is controlled by MCA to build student hostels within the university campus. The Perak State Government had given 1,200 acres of land to UTAR. The university only concentrated on building lecture halls to make money and did not bother to provide student hostels because building student hostels is not so lucrative as building lecture halls. I openly declared that I have no profit incentive and all the profit from rental should be used to build more hostels within the university campus which I could not take away. MCA rejected my donation offer because a few of the MCA leaders who owned most of the land outside the university did not want me to disrupt their lucrative housing development business. Whatever I said was not published in any of the newspapers because the MCA also controls the news media. But this disgraceful episode went viral through the internet. As a result, almost all the MCA candidates lost their seats in the last general election. Let me reproduce the first paragraph or introduction of an article published by retired Appeal Court Judge Dato N H Chan. On 5 Nov 2010, retired Appeal Court Judge Dato N H Chan published an article “Why should MCA interfere with UTAR? “Human nature is such that there are two kinds of human behaviour when it comes to charity – the pretentious and the altruistic donor. I have always doubted the sincerity of those who give to charity by proclaiming it under the flashbulbs of press photographers. In these amusing photo ops, you see the donors posing with an enormous mock cheque to emphasize the size of the donation. If you’re truly charitable, why not dispense with the fanfare and write the amount on a normal cheque? 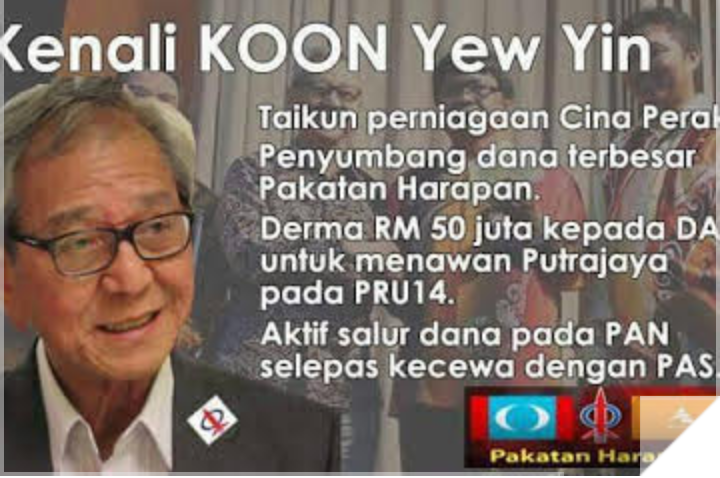 Having said this, I can now tell you about the truly altruistic gesture of philanthropist Koon Yew Yin. He made an offer of RM30 million, quite gratuitously, for the building of hostels for University Tunku Abdul Raman (Utar) students in Kampar”. I shall post the whole article later for those who are interested. God works in a mysterious way to help me make more money with my rejected Rm 30 million donation. I bought Latitude Tree, Lii Hen and VS industry. The former 2 stocks went up more than 800% within 2 years and VS went up 550% with 18 months. As a result, I could easily afford to donate Rm 50 million to build student hostels in Penang to help poor students. With the exception of the Government sponsored University of Science Malaysia, USM, all the other universities in Penang do not provide student hostel accommodations because building student hostels is not a profitable business. They just concentrate on building lecture halls to make more money. About 5 years ago, I offered to donate Rm 50 million to the Penang State Government to build student hostels to help poor students. I also openly declared that I did have profit incentive. The State Exco met and allocated a piece of land of about 60.000 sq. ft. located diagonally opposite USM. As soon as all the design drawings were approved, I called open tender for piling. I selected the piling contractor. Just before the piling contractor could start work, one Gerakan Dato put in his claim for the land. He said that when Koh Soo Khoon was Penang Chief Minister, he was given the right to own the land. This legal battle has been going on for about 2 years and God only knows when my problem can be resolved. I hope Pakatan Harapan will win control of the Government and resolve my problem as soon as possible.